The first step to joining the church is baptism into the Christian faith as a whole. We recognize all Trinitarian baptism and no re-baptism is necessary for those who have been previously baptized, regardless of age. If you have not been baptized, we offer a brief one-hour Understanding Baptism Class in which we discuss the meaning and significance of Christian baptism, the United Methodist understanding of the sacrament, and the logistics of the baptism service at FUMCR. The class is offered once a month. You can complete the membership form either online or in-person in the Joining Room on the Sunday you choose to take your membership vows. 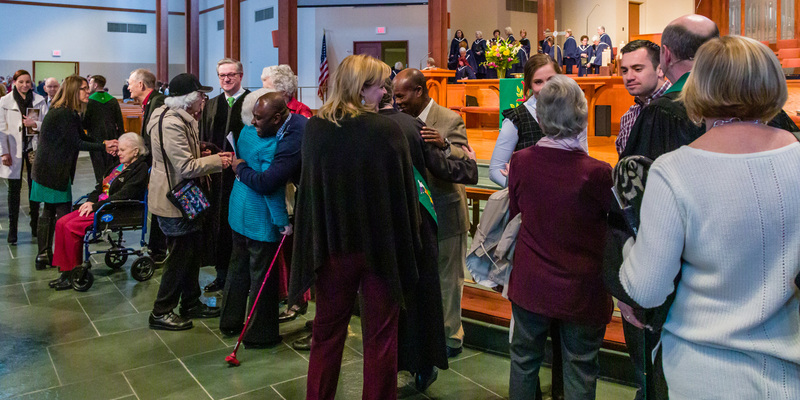 • At the end of each traditional service, a pastor will invite guests to the front to be received into membership and introduced to the congregation. • At the end of each modern service, a pastor will invite guests to visit the Joining Table after the service in a semi-private setting. • After each service, there is an opportunity to join in a more private setting with a pastor in the Joining Room on the north hallway between the sanctuary and Shawver Welcome Center. • You will be asked if you profess your faith in Jesus Christ as your Savior and if you will strive to help FUMCR live out its mission to welcome, grow and serve others in Christ by your prayers, presence, gifts, service, and witness. • The church prays with you and receives you into membership. • You are asked to complete a one-sheet membership form (if you haven’t already completed one online) and take a picture for our church records. • You receive a welcoming packet that gives more information about our church and a small gift from FUMCR to you! That’s it! You are not expected to have all the answers or everything figured out about God or the church itself before joining, as we are honored to meet you where you are. We truly see ourselves as a community of faith striving to learn more about God day-by-day together, and we invite you to join us in that vision!